The sunset wasn't particularly spectacular, but it was a nice still evening. 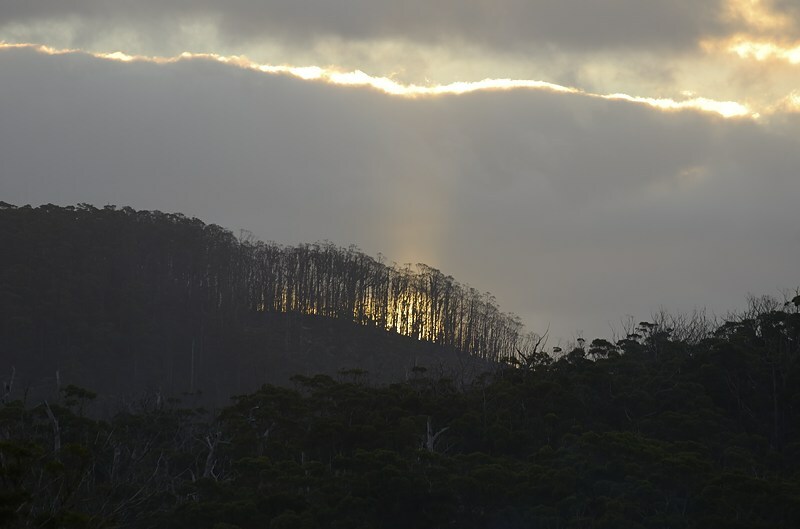 As the sun set behind this hill, the presence of a forestry coupe was made very obvious. I don't know if they've tried to cut as much as possible without it being visible, but if so they failed and here it is. I've located the spot on Google Maps (below), but the imagery is old enough that there isn't a coupe there. Nearby the most southerly coupes are pretty much on the national park boundary around 2.4km from South Cape Bay beach. Don't ever let anyone tell you that the road at Cockle Creek is Australia's southernmost road, the forestry roads they've pushed in go further south.